Of all the programs included in Microsoft’s Office suite, Excel is perhaps the most intimidating. There’s an enormous scope to what you can accomplish with the software, and that can be overwhelming. Even finding the desired function from a packed toolbar can be a challenge — unless you know the right keyboard shortcuts. Unlock the "Essential Microsoft Office Shortcuts" cheat sheet now! It might be impossible to commit all the combinations in this guide to memory, but even one or two essential shortcuts can have a massive impact if you use Excel on a regular basis. Used in conjunction with the standard set of shortcuts Windows Keyboard Shortcuts 101: The Ultimate Guide Windows Keyboard Shortcuts 101: The Ultimate Guide Keyboard shortcuts can save you hours of time. Master the universal Windows keyboard shortcuts, keyboard tricks for specific programs, and a few other tips to speed up your work. Read More that apply to Windows more broadly, these are powerful time-savers that you’ll wish you knew about sooner. 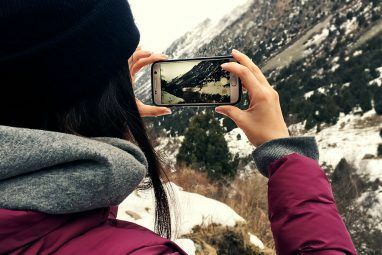 When you’re just getting started with a new spreadsheet, there are plenty of tasks that can be sped up significantly with the right shortcuts. No matter what you’re making, a few of these should help grease the wheels. Using CTRL + T — which corresponds to ^ + T on Mac systems — converts a selection of cells into a table, with sortable headers that can be edited at will. CTRL + A or COMMAND + A will typically select the entire spreadsheet, but it will only select cells within a table if you’ve clicked on it before using the shortcut. If you want to create a basic bar graph 8 Types of Excel Charts and Graphs and When to Use Them 8 Types of Excel Charts and Graphs and When to Use Them Graphics are easier to grasp than text and numbers. Charts are a great way to visualize numbers. We show you how to create charts in Microsoft Excel and when to best use what kind. Read More based on a set of data, highlight everything that you want to be included and use ALT + F1 on Windows or FN + ? + F1 on a Mac. Using F11 or FN + F11 creates this chart in its own separate sheet. Using filters can be a godsend when working with a large spreadsheet, particularly if you find yourself struggling to find key pieces of data 4 Excel Lookup Functions to Efficiently Search Spreadsheets 4 Excel Lookup Functions to Efficiently Search Spreadsheets In a giant Excel spreadsheet, CTRL+F will only get you so far. Be clever and let formulas do the hard work. Lookup formulas save time and are easy to apply. Read More . CTRL + SHIFT + L (COMMAND + SHIFT + F on OS X) will toggle AutoFilter on and off, allowing you to sort and filter content at a moment’s notice. Finally, there are a few shortcuts worth having on hand when you’re working with formulas. You can toggle formulas on and off using CTRL + `, or via ^ + ` on Mac systems. F9 — FN + F9 for Apple users — will calculate your worksheets, or will calculate the current worksheet if combined with a SHIFT modifier. You can also use F9 contextually to evaluate part of a formula. Here’s one combination that’s sure to see some use whenever you add a row of totals to your spreadsheet. Use ALT + = to Autosum the cells you have selected — Mac users can execute the same functionality be pressing COMMAND + SHIFT + T.
When you’re working with a large Excel document, it can sometimes be a fiddly and time-consuming process just to navigate to the data you need. Learn these shortcuts by heart, and you’ll be whipping around your spreadsheet at a mile a minute. 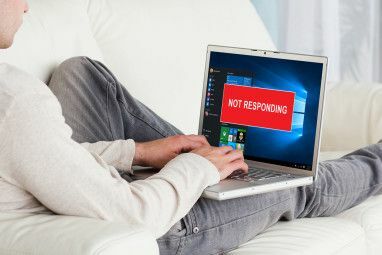 If you find yourself losing the active cell, worry not — you can navigate to it instantly by pressing CTRL + BACKSPACE on a PC or COMMAND + DEL on a Mac. On a blank document, pressing CTRL + an arrow key will simply take you to its outer limits, but on a populated spreadsheet it’s much more useful. Instead, it will take you to the edge of your data in the stipulated direction, which makes it a handy way of finding the last row or column in a particular table. On a Mac, the command is ^ + an arrow key. Once you’ve found the cell you’re looking to work on, you can of course double-click it to start making edits. However, there’s a keyboard shortcut available too; simply press F2 with the desired cell selected to start editing immediately — on a Mac, you’ll need to hit ^ + U. Shift + F2 (or FN + Shift + F2 on a Mac) adds or edits a comment attached to your selection. A few combinations were designed to help with negotiating a document that spans more than one sheet. CTRL + HOME sends you back to cell A1 of the current sheet, while CTRL + PGUP and CTRL + PGDN switch between worksheets. Shift + F11 adds a new worksheet altogether. On a Mac, the above commands are all a little different; FN + ^ + ? takes you back to cell A1, FN + ^ + ?/? switch between worksheets, and FN + Shift + F11 creates a new worksheet. If you’re ever in a position where you think better of something you’ve just entered into a cell, a quick tap of ESC is all you need to remove it. 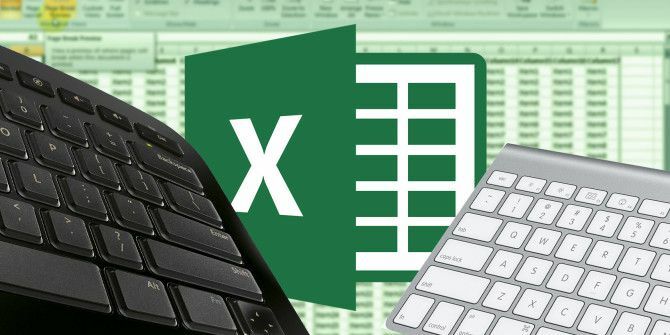 Whether you’re delving deep into data entry, or simply setting up your spreadsheet for the first time 8 Tips for How to Learn Excel Quickly 8 Tips for How to Learn Excel Quickly Not as comfortable with Excel as you would like? Start with simple tips for adding formulas and managing data. Follow this guide, and you'll be up to speed in no time. Read More , using these shortcuts will speed up your input considerably. For starters, press CTRL + ; with a cell selected to populate it with today’s date — that’s ^ + ; on a Mac. Using CTRL + SHIFT + : (or ^ + SHIFT + :) prints the current time instead. CTRL + D or ^ + D on OS X will populate the currently selected cell with whatever is in the cell directly above it, and using CTRL + R/^ + R will use whatever’s in the cell directly to the left. In certain cases, it might be beneficial to combine these shortcuts with CTRL + SPACEBAR (^ + SPACEBAR for Mac users) or SHIFT + SPACEBAR, which select an entire column and row respectively. If you’re ever in need of a way to fill any selection of cells with one input, there’s a very easy method of doing so. Make your selection and enter whatever is necessary in the active cell, then press CTRL + ENTER (^ + RETURN on a Mac) to populate the whole thing. We all know that CTRL + V is the shortcut for paste, but in Excel things can be a little more complicated than normal. CTRL + ALT + V (or ^ + COMMAND + V on a Mac) opens the paste special dialog, which can be very handy if you’re importing something from another application and want to ensure that it’s unchanged by the process. Your go-to formatting shortcut should be CTRL + 1 (COMMAND + 1 on Mac systems). No matter what you have selected, this should open the basic formatting dialog for that content. It’s often useful to format particular cells to a particular type of number in Excel, and there are plenty of different shortcuts that will instantly do that job. Each uses CTRL + SHIFT + another key, or ^ + SHIFT + another key on OS X.
CTRL + SHIFT + ~ applies the general format, while CTRL + SHIFT + $ puts numbers in currency format, appropriately enough. CTRL + SHIFT + % will unsurprisingly turn your numbers into percentages, and CTRL + SHIFT + ^ will present it in scientific format. CTRL + SHIFT + # results in a date, CTRL + SHIFT + @ results in a time, and CTRL + SHIFT + ! applies standard number formatting. 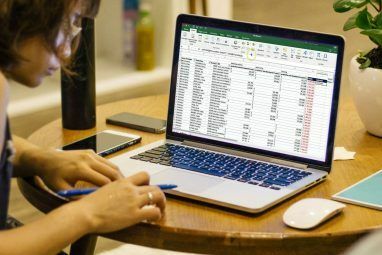 Of course, formatting in Excel goes beyond numbers alone How to Visualize Your Data Analysis with Excel's Power Tools How to Visualize Your Data Analysis with Excel's Power Tools Excel is killing it with its advanced data management features. Once you have used one of the new tools, you will want them all. Become a master of your data analysis with power tools! Read More — these combinations will give you access to a bevy of borders, so you can present your work effectively. Use CTRL + SHIFT + & (or COMMAND + ? + 0 on a Mac) to add a border outline around your selection. From here, you can fine-tune your borders by using ALT + R, ALT + L, ALT + T and ALT + B for borders on the right, left, top and bottom respectively. Corresponding combinations for Mac users are COMMAND + ? + arrow buttons. Using the shortcuts once will add the border, just input it again to remove it. CTRL + SHIFT + _ (or COMMAND + ? + _) will remove all borders within the current selection. Have you got a particularly handy Excel shortcut to share? Or are you looking for a shortcut to a common task How to Find Every Microsoft Office Keyboard Shortcut You Could Ever Need How to Find Every Microsoft Office Keyboard Shortcut You Could Ever Need Finding a complete list of keyboard shortcuts can be a chore. Let Word automatically generate a list of all of its shortcuts! You'll find keyboard shortcuts for other Office applications, too. Read More that’s not covered in this article? Why not offer some assistance, or ask for help in the comments section below? Explore more about: Keyboard Shortcuts, Microsoft Excel, Productivity, Spreadsheet. I would like to know a shortcut on how to insert the em-dash in Excel. Is there a way for EXCEL to not only find a string in a comment but to also hi-lite it? Some of my comments are very long and its difficult to find the string within the comment. Thanks for your question, Dan! I see you also commented on the Excel Search article Dann Albright worte. I'm afraid I don't know, but if one of our authors knows or I come across it, we'll definitely cover it. Thank you for the idea! I agree with It - maybe you could do 2 separate versions - one for win and one for mac ? Shift+F2 doesn't seem to work in Excel 2016, or am I doing something wrong? Disregard, it works. I just had Shift+F2 remapped to do something else. This is great information, but paragraph layout is very difficult to read. You should add a summary chart at the beginning or end for ease of reading. Thank you for the feedback! We'll keep this in mind for the next keyboard shortcuts roundup.